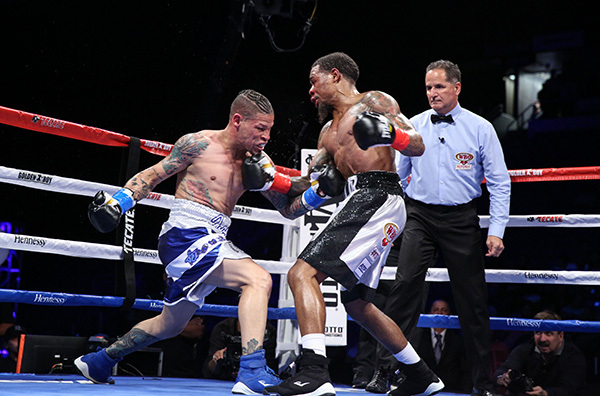 Lamont Roach, Jr. (16-0-1, 6 KOs) will make his third headlining appearance when he takes on Deivis Julio Bassa (20-4, 12 KOs) in a 10-round fight for the vacant WBO International Super Featherweight Title in the main event of the July 20 edition of Golden Boy Boxing on ESPN at the Oasis Arena in Cancun, Quintana Roo, Mexico.ESPN and ESPN Deportes will air the fights beginning at 7:00 p.m. ET/4:00 p.m. PT. ESPN3 will live stream undercards beginning at 5:30 p.m. ET/2:30 p.m. PT. Roach Jr. is a 22-year-old native of Washington, D.C. who debuted as a professional in April 2014 after an impressive run as an amateur through the NoXcuse Boxing Club. Since then, Roach’s combination of skill and technique has made him into an important player in the super featherweight division. Roach Jr. is coming off a controversial draw against Orlando “El Fenomeno” Cruz in a fight that many believed he won, and he’s ready to erase any doubts about his ability to become a world champion on July 20. Bassa is a very experienced warrior from Monteria, Colombia. The 37-year-old southpaw has participated in tough battles against other contenders of the exclusive Golden Boy Promotions stable, including Joet Gonzalez and Ronny Rios. Bassa will look to test Roach Jr. and prevent him from earning a regional title in what will be the first fight in Mexico for both fighters.